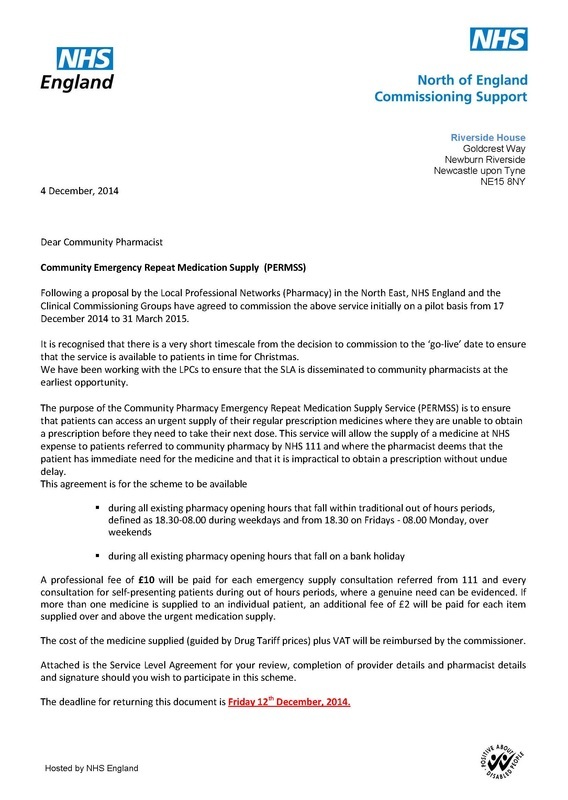 NHS England are commissioning an Emergency Supply of Medication Service across the entire region. They have written a letter and produced a SLA for the service and these are now available below. The turnaround for commissioning this service is very tight. 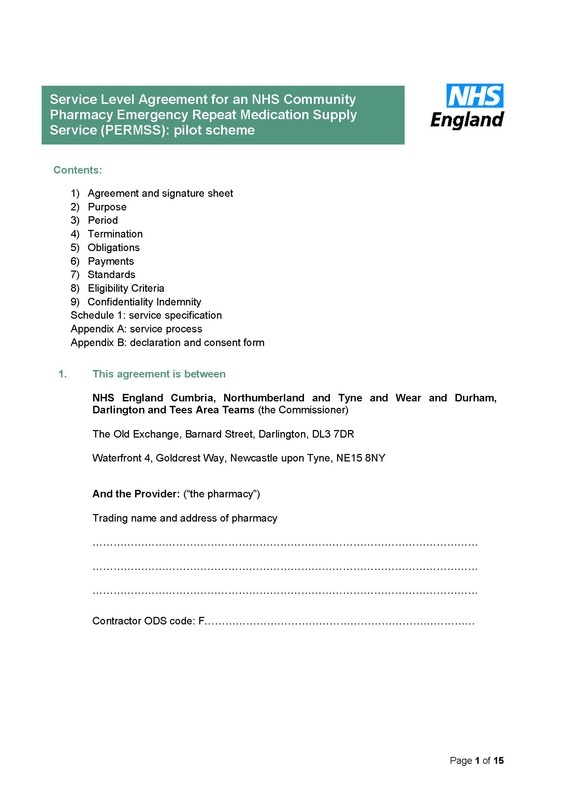 Signed SLAs need to be returned to Provider Management at NECS by before 12th DECEMBER for inclusion in wave one of this pilot scheme. The scheme will then go live on 17th DECEMBER. If you do no have a scanner you can use a smart phone or tablet with a camera to take a photo of the pages. The commissioners and LPC apologise for such a tight timescale but this service received funding agreement very recently and as the purpose is to relieve pressure on urgent care services, it needs to be running before Christmas. 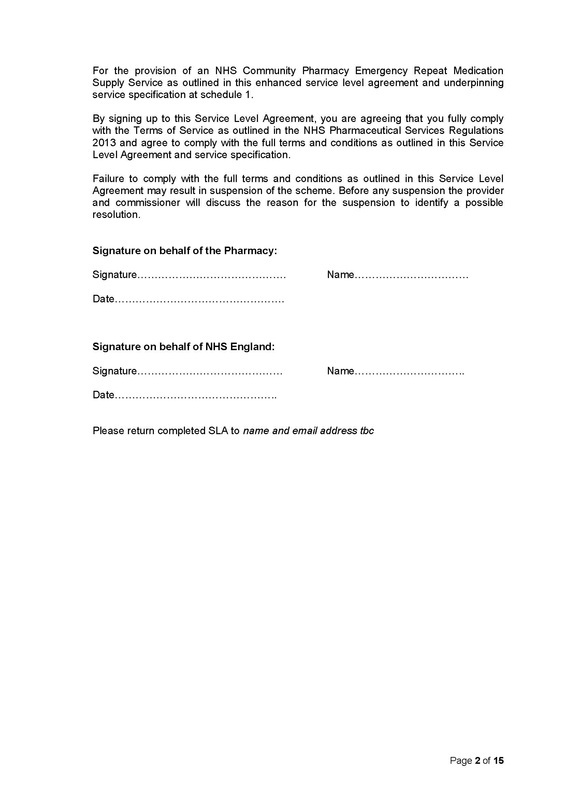 We have had very limited time to agree the service, set up PharmOutcomes and get the documents produced. Please ensure you read the SLA and service specification carefully to ensure you fully understand the service being commissioned. In short, patients either presenting at the pharmacy as walk-ins or referred to pharmacy by NHS 111 who have run out of their medication, can be given an emergency supply at NHS expense. Those who pay the prescription levy will be required to pay this. Those exempt from the prescription levy will receive the supply free of charge. A seven day supply can be made or the smallest original container for creams, inhalers, contraceptives, etc. Pharmacies will be reimbursed £10 per consultation for a single medicine and an additional £2 fee for any additional medicines required. The medicines will be reimbursed at drug tariff plus VAT. 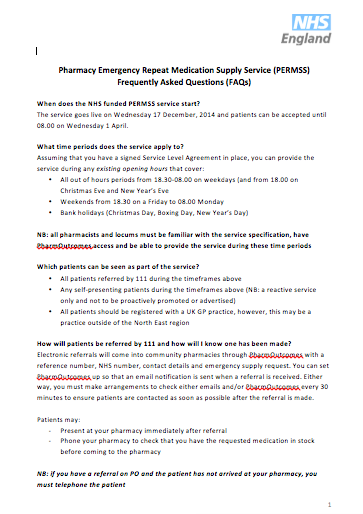 Referrals from NHS 111 will be made by PharmOutcomes and the service specification requires you to check for referrals every 30 minutes. Remember if you make sure there is an email address in your details on pharmoutcomes you will be also notified by email that a referral has come in. Visit the admin section of pharmoutcomes to check your email. The service will run during the out of hours period only, i.e. 6.30pm to 8.00am mid-week and 6.30pm Friday until 8.00am Monday on weekends. The service will also operate on Bank Holidays. Patients presenting for emergency supplies outside of these times should be dealt with by your usual current practice. Further services are being discussed for development following from this service, such as referral of patients directly to pharmacies by NHS 111, so this is the first step in integrating pharmacies much more closely. We need to show our commitment as a profession to this development by signing up and delivering this service. Please ensure that locums or staff who work at the weekend are aware of this service, given they are most likely to receive referrals. Please ensure that you meet the turnaround time if you want to participate in this valuable service.